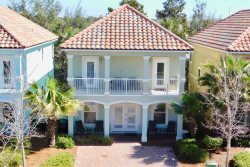 Zoe's Place in Emerald Waters Village - Newly Constructed Custom Coastal Retreat!! This well planned custom home leaves nothing to be desired, with 2 Laundry centers, 2 full Size Refrigerators, under counter Ice Maker and extra Beverage Center.Beautifully designed with the stylish Coastal Themed Furnishings and Decor. Lots of comfortable seating in Living room, One King Master suite on first floor, Two complete King Master Suites on the second floor, and a Bonus King master on the second floor with en-suite bath, and Bunk room with 4 beds. This fine Cottage has all the comforts of home and more!!! The Private Beach Access is just 1 block away and we offer a large rolling cart with several beach chairs. Master bath has double vanity, Large walk in shower and Large closet! Extras galore in this New Luxurious home including everything you need for cooking amazing meals. The Spaciou Open floor plan is perfect for gathering together as family and friends. Lots of Comfortable seating in Living area with 65" 4K LED TV.